The most distant massive galaxy cluster, located about 9.6 billion light years from Earth, has been found and studied. Astronomers nicknamed this object the "Gioello" (Italian for "Jewel") Cluster. Using Chandra data, researchers were able to accurately determine the mass and other properties of this cluster. Results like this help astronomers understand how galaxy clusters have evolved over time. A newly discovered galaxy cluster is the most massive one ever detected with an age of 800 million years or younger. Using data from NASA's Chandra X-ray Observatory, astronomers have accurately determined the mass and other properties of this cluster, as described in our latest press release. This is an important step in understanding how galaxy clusters, the largest structures in the Universe held together by gravity, have evolved over time. A composite image shows the distant and massive galaxy cluster that is officially known as XDCP J0044.0-2033. Researchers, however, have nicknamed it "Gioiello", which is Italian for "jewel". 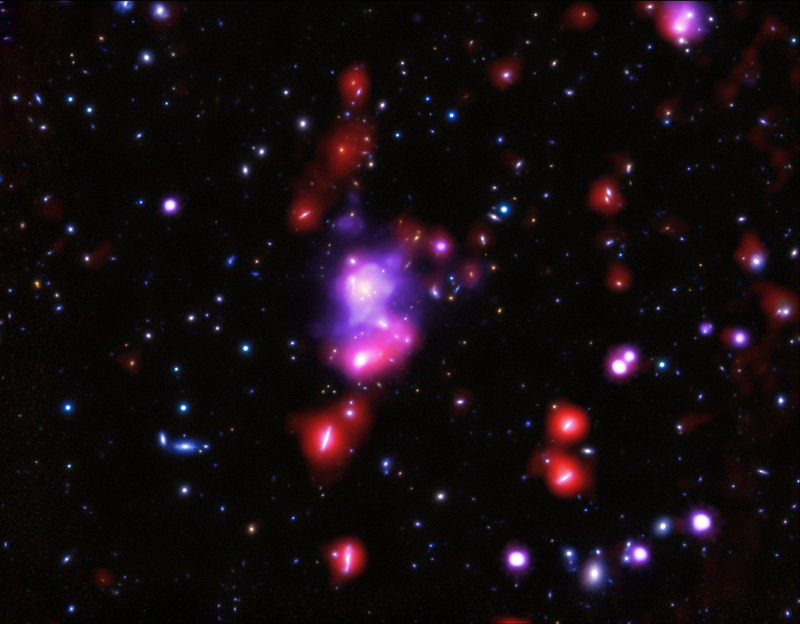 They chose this name because an image of the cluster contains many sparkling colors from the hot, X-ray emitting gas and various star-forming galaxies within the cluster. Also, the research team met to discuss the Chandra data for the first time at Villa il Gioiello, a 15th century villa near the Observatory of Arcetri, which was the last residence of prominent Italian astronomer Galileo Galilei. In this new image of the Gioiello Cluster, X-rays from Chandra are purple, infrared data from ESA's Hershel Space Telescope appear as large red halos around some galaxies, and optical data from the Subaru telescope on Mauna Kea in Hawaii are red, green, and blue. Astronomers first detected the Gioiello Cluster, located about 9.6 billion light years away, using ESA's XMM-Newton observatory. They were then approved to study the cluster with Chandra in observations that were equivalent to over four days of time. This is the deepest X-ray observation yet made on a cluster beyond a distance of about 8 billion light years. Previously, astronomers had found an enormous galaxy cluster, known as "El Gordo," at a distance of 7 billion light years away and a few other large, distant clusters. According to the best current model for how the Universe evolved, there is a low chance of finding clusters as massive as the Gioiello Cluster and El Gordo. The new findings suggest that there might be problems with the theory, and are enticing astronomers to look for other distant and massive clusters. Coordinates (J2000) RA 00h 44m 05.20s | Dec -20° 33´ 59.70"
A newly discovered galaxy cluster is the most massive one ever detected with an age of 800 million years or younger. About 9.6 billion light years from Earth. 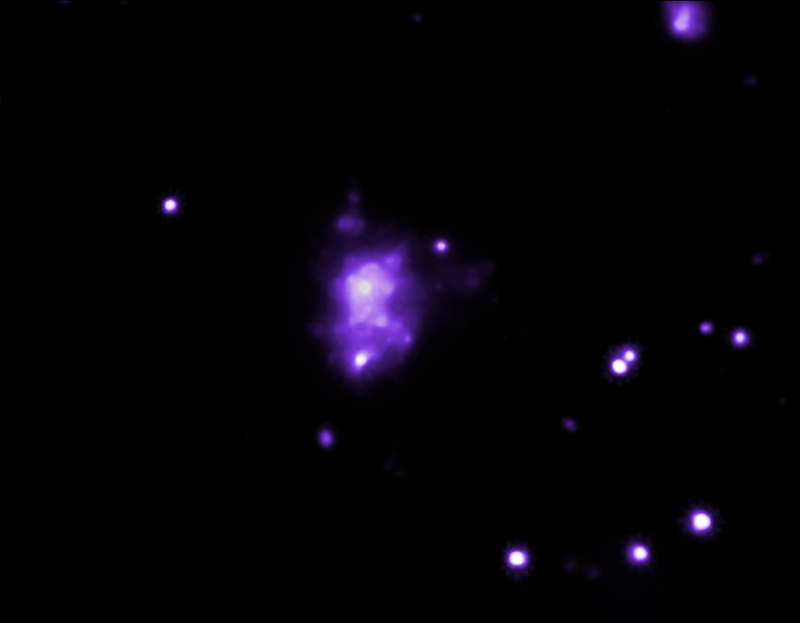 Combines X-rays from Chandra X-ray Observatory, optical data from the Subaru telescope, and infrared data from ESA's Hershel Space Telescope. About 6.2 million light years across. In the constellation Cetus in the Northern Hemisphere.